Our specialized traffic law division has defended over 10,000 Georgia motorists with traffic and speeding tickets in courts across the state. Got a Georgia traffic or speeding ticket? Fix it! Most Georgia traffic or speeding tickets will cost you anywhere from $1200-$5000 over 3-5 years! We can save you this money. No points, No record, and No court appearance. 1. To begin, please fill out the FREE CONSULTATION FORM or call 404-310-9795. 2. When we receive your information through our website form, Cindy Fraschilla, our traffic defense director, will call you, explain how we can help you, and also give you an immediate FREE legal fee quote for your consideration. 3. If you accept our Legal Representation Offer, by paying the legal fee and sending us a copy of your traffic ticket, then we do all the work representing you before the court, no matter how many appearances or how much work is involved. In other words, there are no hidden fees. Usually, you will not need to appear in court, though for some cases and courts this may be necessary. 4. When your ticket is successfully resolved, we will provide you with the final disposition, court paperwork, discuss in person any questions you may have, and give you any instructions to follow if there is a fine to pay the court to keep your ticket off your driving record, or other possible requirements. 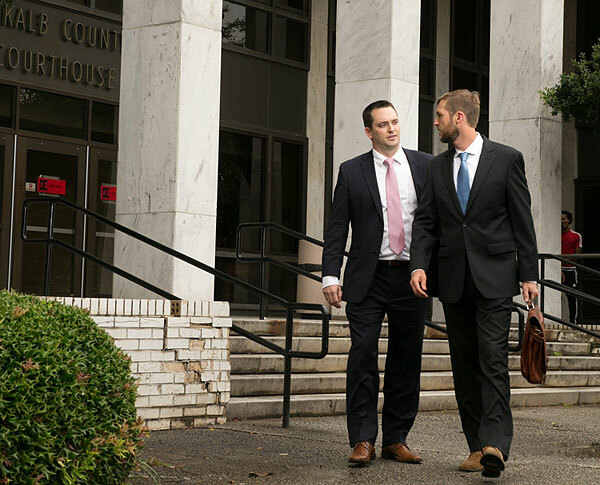 We want it to be easy for you to retain the legal experience of the Georgia law firm of Hendrick and Henry. Joseph Henry (L) leads our traffic law defense division. Troy Hendrick (R) leads our personal injury division. We have developed a highly specialized division of our firm dealing only with Georgia traffic and speeding issues. That means that our firms’ attorneys are actually practicing in the local Georgia courts where your ticket will be prosecuted — day to day, month to month, and year to year. For over thirteen years, the traffic division attorneys at Hendrick & Henry have cultivated these relationships and will put them to work for you. Your driving record is very valuable, even though most people don’t know it. The premium you pay for your insurance is based on several variables. By far the most significant variable is your driving record. Any conviction, even for minor infractions, will show up on your driving record. Then your insurance company will raise your rates. They will stay elevated for 3-5 (sometimes 7!) years. Over this time, you will literally pay thousands in additional premiums. To verify this, we encourage you to call your insurance agent to ask them what effect a conviction will have on your premium. We can save you thousands by avoiding this. The easiest way your insurance company discovers a conviction is through your driving record. We are very successful in avoiding ANY record. We can prevent ANY points from being assessed. Recently, we’ve seen a push by some data-mining companies to find infractions even if they are not on your driving record (other ticket defense firms won’t tell you this). Then they sell this information to your insurance company so they can raise your rates. At Hendrick and Henry, we do everything in our power to make this difficult for your insurance company. No going to court, no multiple trips, and no missed work.